Chimps, our closest relatives, can pass down knowledge and skills, like using a new tool for instance, and establish cultural communities, according to a recently study published in PLOS Biology. Communicating and passing down skills, inventions and knowledge is considering a pre-requisite to what we commonly refer to as human culture, and the findings suggest that this kind of behavior can be traced back to the common ancestry we share with other primates. 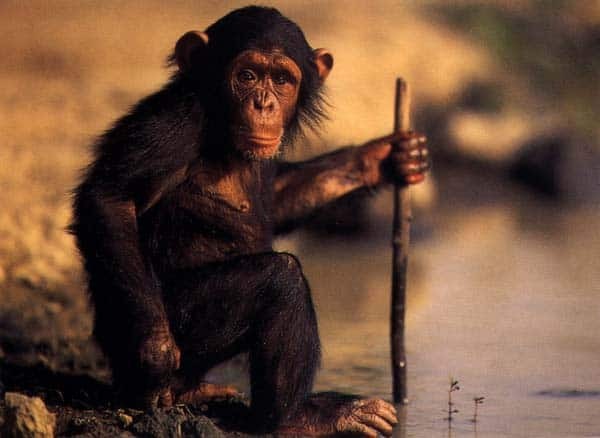 Dr. Catherine Hobaiter from the University of St. Andrews was always fascinated that some chimp communities employ certain tools, while neighboring communities use other tools or no tool at all for a given task. This suggests that these various practices and habits suggest that there are different chimp cultures, and that these are passed down from other chimps. For instance, a community Hobaiter and colleagues studied uses leaf sponges – leafs folded in the chimp’s mouth – to dip the water and drink from them. Quite civilized. It’s almost impossible to tell when this technique was introduced or who the original inventor was. The researchers, however, were fortunate enough to witness the introduction of a new tools before their very own eyes. Nick, a 29-year-old alpha male chimpanzee, made a sponge made of moss while being watched by Nambi, a dominant adult female. Soon enough, seven other chimps were found to make and use their own moss sponges in just six days following the invention. It’s a remarkable example of social learning, yet this is the first time it was witnessed in the wild! To demonstrate the inheritance of the sponge, the researchers build a complex static and a dynamic network model. The most conservative estimate of social transmission accounted for 85% of observed events, with an estimated 15-fold increase in learning rate for each time a novice observed an informed individual moss-sponging. Chimps can be so amazing at adapting to their environments and are remarkable social creatures (I have a hunch they’re not the only primates capable of doing this either). Chimps use specific gesture language to communicate with their peers, a behavior which is most likely also culturally passed down. But maybe the most evident display of chimp culture is that they also embrace fashion fads. Yes, you’ve heard right – after following a group of chimps from the Chimfunshi Wildlife Orphanage Trust, a sanctuary in Zambia, researchers found that after an individual was ‘parading’ around with a grass in his ear, other chimps began to do the same after a while.